If you are a member of the Baby Boomer generation you are approaching or have already entered a new phase of your life, sometimes called retirement. In addition to not going to work and playing a lot of golf, or launching a new career, you may also have started to think about making end-of-life plans. You, know, those things you didn’t want to think about earlier in life… like your legacy. Just what do you want for your children and grandchildren? 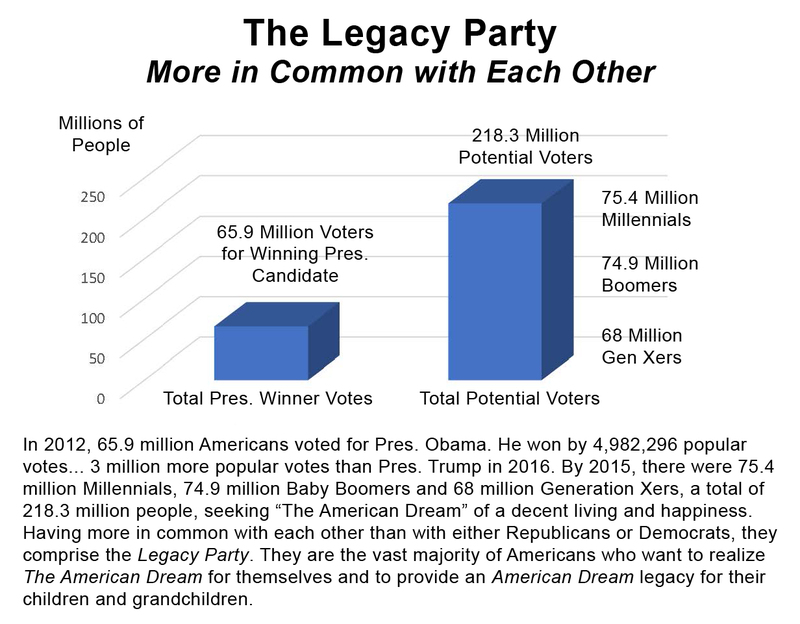 If you are a Generation X or Millennial generation member you are fighting for survival in a world that has literally gone nuts with… crushing debt; under employment or no employment; no healthcare; no savings; an insane government; avarice-driven politicians; continuous wars; and crumbling roads and bridges. It’s like you’re living in one of the dystopian Matrix films. Still, it is time to seriously consider that you must take steps to recover a chance to have a good, happy life… one like your parents. All of us want a good education, satisfying employment, financial security, safety and good health. And, yes, we all want a bevy of material things, too, like a nice home, in a safe neighborhood, a good car, vacations, etc. We all want liberty, opportunity and equality. We want the opportunity for prosperity and success, as well as an upward social mobility for the family and children, achieved through hard work in a society with few barriers. In the definition of the American Dream by James Truslow Adams (1931): "life should be better and richer and fuller for everyone, with opportunity for each according to ability or achievement" regardless of social class or circumstances of birth. That is Our American Dream. And, we will have it. We, together, can change the direction of our cities, states, nation and our world. Is Today the Change We Hoped For? Seems like yesterday when we were kids, doesn’t it? A lot has changed since the 60s & 70s, don’t you agree? But, things have gone in the wrong direction. Sadly, in fact, social inequities have actually gotten much worse. Today, in addition to the black segment of our society, as perceived in the 60s & 70s, the victims are everyone else, too, including the entire middle class — the 99.9%. For the first time in the history of the United States, our children and grandkids will have less of everything than we have – less freedom, less opportunity – and yes, even less of the material things of life, too. All over the world people are struggling financially. Recently, the respected humanitarian organization, Oxfam International reported: “Eight men own the same wealth as the 3.6 billion people who make up the poorest half of humanity.” Please go here for their report: An Economy for the 99% (PDF). Collectively worth $426 billion, the eight are: Bill Gates, Warren Buffett, Carlos Slim, Jeff Bezos, Mark Zuckerberg, Amancio Ortega, Larry Ellison and Michael Bloomberg. The Oxfam report said that the richest 1% has owned more wealth than the rest of the planet since 2015. In the U.S., the richest 1% control 42% of the wealth. “The report found that income inequality has increased in every US state since the 1970s — and that it has risen further in numerous states in the post-Great Recession world. The top 1% of income earners captured the majority of income growth from 2009 to 2013 in 24 states.” Check the article here. Finally, as you intuitively knew, "The stock market is rigged," Michael Lewis told Fresh Air's Terry Gross. "It's rigged for the benefit for really a handful of insiders. It's rigged to ... maximize the take of Wall Street, of banks, the exchanges and the high-frequency traders at the expense of ordinary investors." Michael Lewis, A Wall Street Revolt Flash Boys. Is a starvation-level income with no potential and a rigged system that only rewards a tiny few players the legacy you want to give to your grandchildren? In the beginning, most Boomers started their careers following their hearts and making a difference. Many of us did things like protesting the draft; protesting the war in Vietnam; working for equal rights for women; and civil rights for Black Americans. Then families happened. We had to find employment in the work-a-day world and create a stable home for our children. That took us in every direction, from working for the “man” to starting our own businesses. Some of us continued on the “making a better world” path, while others gave in, ending up just like most of our parents, making a dollar doing a job so we could put bread on the table, buying a home, a car, and sending the kids to college. Don't get me wrong. Taking good care of your family, your children, is making a difference — the most important difference. But, by doing so we took our eyes off the ball, turned over responsibility for our livelyhood, our healthcare — our nation — to "the powers that be" and went back to making a living. Fast forward to today… you know the story. The work was not fulfilling; the companies went “global” and the jobs evaporated. Basically, the "powers that be" changed the game on us when we weren’t paying attention. We trusted those in power to be honest and look out for the best interests of the nation. They didn't and we were naïve. For that naivety we have already paid a heavy price. So, now what? For many of us who still have our health and still have the necessities of life, we have a reasonable opportunity to refocus our energies on rearranging our priorities toward putting those important ones back on top of the list and making a living world to pass along to the grandkids. You know, one where the potholes are fixed, the bridges are not falling down, our food is wholesome and our healthcare is targeted on our health rather than on costly meds and the CEO's wellbeing. 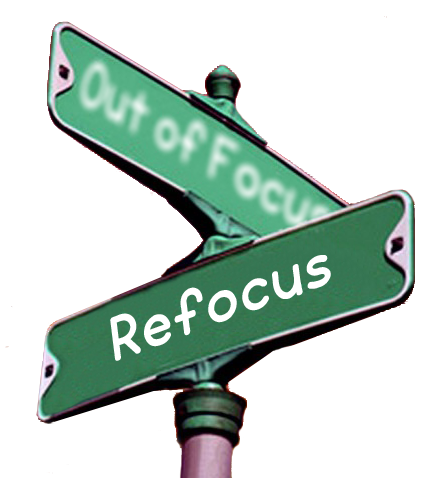 Please go here to take a look at refocusing and making health a priority. In 2012, Matt Damon helped pay tribute to the late historian and author Howard Zinn. This rendition of a speech Zinn gave in 1970 on civil disobedience is one of his most powerful performances to date. It is still true... The Problem is Still Civil Obedience.